Alabama’s First Robotic Assisted Spinal Fusion Using Intraoperative Imaging Performed by Neurosurgical Associates, PC at St. Vincent’s: Birmingham. Click here to read more. Innovative Cardiac Pump a Lifesaver for Critical Patients Click here to read more. August is Neurosurgery Awareness Month! Neurosurgeons don’t just specialize on the brain. We have included a video for you to view and learn what the field of Neurosurgery fully encompasses. Click here to read more. Dr. Clark discusses minimally invasive spine surgery using state-of-the-art technology. Click here to read more. Dr. Clark discusses a new technology for spinal fusions, and what this means for patients. Click here to read more. Several of our physicians were featured in the Jefferson County Medical Society’s Pulse Spring Newsletter discussing the new Mazor Robotics System. Click here to read more. When it comes to spine surgery, we offer one of the most experienced teams in the world and the most state-of-the-art technology, providing patients with unparalleled precision and results. 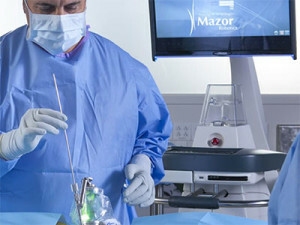 We perform advanced spine surgery using the Mazor Robotics Renaissance™ Guidance System. Click here to learn more. Cervical Radiculopathy Can Be A Pain In The Neck. Most neck pain is caused by issues with the muscles in the neck. However, neck pain can also be caused by wear-and-tear from aging or overuse through conditions like arthritis. Irritation or compression of one or more nerve roots in the cervical spine may result in Cervical Radiculopathy. Neurosurgical Associates, PC can help you with your cervical issues, and provide treatment for neck pain, radiculopathy, and other cervical conditions.